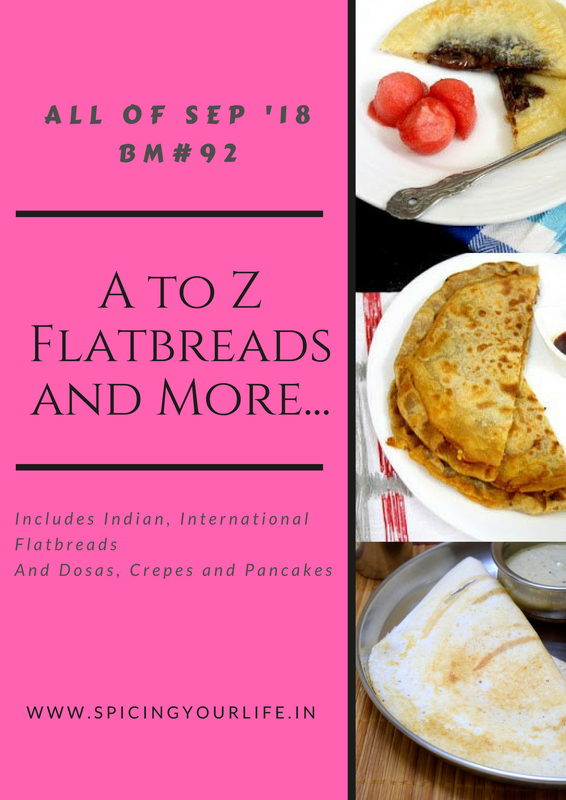 If you are following my blog for the past 18-20 days, you will be knowing that I am sharing International FlatBreads in the order of A-Z. What I am loving in this series of flatbreads is that most countries have some or the other sort of flatbreads, and while many are so much alike yet they are different in taste and textures. So today for the letter T, I decided to try Tiganopsomo , Greek version of fried bread. I have taken this recipe from here. Tiganopsomo is made just with a few ingredients and the end result is a perfect flaky crusty bread. The dough is quite rich as it contains a lot of butter and is stuffed with feta cheese. The flatbread is then traditionally fried. I made the pan fried version as would had too much fat If I had fried it. While preparing this Greek fried bread , let the dough rest for a while so it is easy to roll. Roll the dough as thin as possible as we are going to have a cheese layer followed by another layer of dough to cover and seal it. It needs to be thoroughly cooked inside out while shallow frying. Do not add too much of cheese in it as then you would not be able to seal the edges and the cheese will ooze out while frying. You can even replace the feta cheese with a combination of feta and Greek hard yellow cheese, for a more “cheesy” texture. You can also add some fresh herbs like oregano, mint or dill for extra flavour. I kept it simple with just some feta cheese. Serve this while still warm as a starter or a snack to enjoy that crunchy flaky . Delicious round packets of soft, golden shallow fried bread, wrapped around a rich, melting feta cheese filling that can be enjoyed as a starter or side to any savory dishes. Add the flour into a large bowl and mix in the salt, sugar, yeast and pour in the olive oil. Knead the dough by slowly incorporating the lukewarm water until the dough forms a smooth and elastic bowl. Let it rest for 30 minutes or so. Divide the dough into equal size balls (around 4-6). Roll them into circles of 4-6 inches in diameter as thinly as possible, but enough so that it does not tear. Spread feta cheese on one disc, and place the other on top of this. Seal the edges. One can make some designs using fork. Heat a pan and shallow fry it on both the sides until golden brown. You can use some oil for shallow frying. Serve it while still warm. Love to read your comments and feedback. Do drop a line in the comment section if you like and do not forget to rate the Recipe. If you try this recipe, would love to see your creations, take a picture and do tag me at @cookwithrenu using the hashtag #Cookwithrenu on Facebook, Twitter, Google+ and @Renunad on Instagram. Subscribe to my email list so that you get the recipe straight in your mailbox. Did you check our Offers & Promotions page yet? If Not do click here. Follow me on Facebook, Pinterest, Instagram, Twitter or Google+. Sharing is Caring, Click one of the Social networking buttons below to share this recipe. Tiganopsomo is definitely an incredible pick Renu, and feta cheese stuffing sounds absolutely yum. A real treat for cheese lovers. Those fried breads looks dangerously addictive. I can never say no to any bread with cheese. That too when it is deep fried, crunchy in texture, then I am in. Please pass that plate Renu. The breads look fantastic..
Tiganopsomo , the Greek bread ! First to remember and pronounce the bread name is going to be a job ! But what a delicious looking bread . Feta cheese must be making it taste so good , I can see a crisp crust and a soft filling ! Amazing ! Feta cheese stuffed bread sounds like a flavorful bread. I have been trying to get used to the idea of feta cheese but I am yet to work with it. I am sure this would be the first one to try! Feta cheese stuffed bread looks so flavorful and tasty. Very interesting way to make a stuffed bread. With that stuffing, I am sure it must have tasted so good. I am hearing about this for the first time, so surely bookmarking for later preparation! What a wonderful find Renu, we get to learn about a new bread and that too filled with feta cheese. Would love to bite into the flaky flatbread. Another awesome find Renu! Never heard of this bread but the feta filling sure sounds super delicious!! What a fantastic bread this is and what a great find. Love the bread with the feta cheese in the center. I love feta cheese and this bread making me drool over on screen. such a gorgeous looking fried bread you make. loved this, bookmarking to try once. I am a bread lover, especially homemade bread. I have never tried “fried” bread, but I am game. This sounds like a fun weekend experiment. I just happen to LOVE Greek food too. Oh, yum! I love fried bread, and the warm feta sounds so perfect on this. Thanks for sharing! Can’t wait to give it a try. What a neat series of recipes! I really enjoyed learning about how the Greeks do flatbread. Feta is my FAVORITE cheese! This sounds delicious. You had me at melted feta. This sounds like a perfect appetizer when hosting guests. I have never tried this and I love Greek food, it’s just so comforting! Ohhh give me some of that! That looks scrumptious. I love bread and feta cheese, so what’s there not to love about this flatbread! Buttery dough and feta… say no more. I’m interested! This sounds and looks absolutely delicious! Nothing I like more than cheese and carbs. Thanks for sharing! This looks yummy! I’m all for a delicious flatbread with feta. This sounds so interesting. I love fried bread, and not to mention cheese. So this combination is unique and definitely a favorite! This Greek fried flatbread with feta sounds wonderful. I love Greek food but have never had tiganopsomo! Def pinning this for later! Yes, I find your flatbread sharing so fun! Really so unique and quite educational, too! 🙂 Thank you so much for bringing something fresh to the world of food blogging! I have never made fried bread but my husband talks about it often. This recipe looks super tasty and I love the greek flavors!